Performance pedagogy at the U.S.S. Arizona Memorial located on the campus of the University of Arizona. Description: 153 undergraduate students draw their breath and place their cares inside of a red vessel. A silent, single file line of peace is drawn across the campus and the vessels are carried to the U.S.S. Arizona Memorial and cast down into the space. Once students free their own cares, they acquire a new vessel from the floor of the memorial space with the intent of helping others release their cares. During the performance, students hear the tolling of a bell recovered from the remains of the U.S.S. Arizona, as well as a military helicopter flyover. 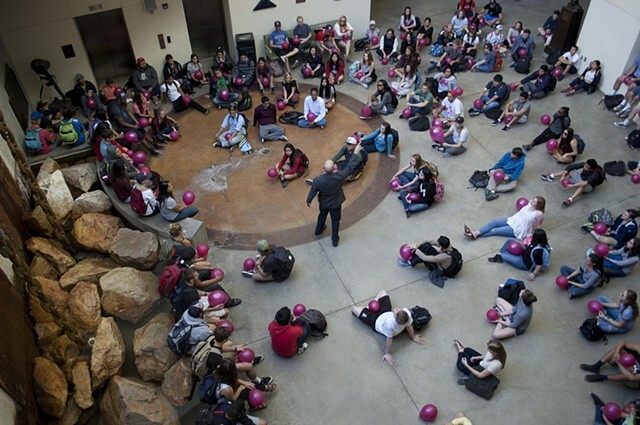 While it may read as a traditional balloon release, it actually results in the discharge of stored energy at a specific time and location, creating a resonance that dances across the campus.